The Archivo Pavilion would like to welcome the Design Public and the Local Community under his new roof. 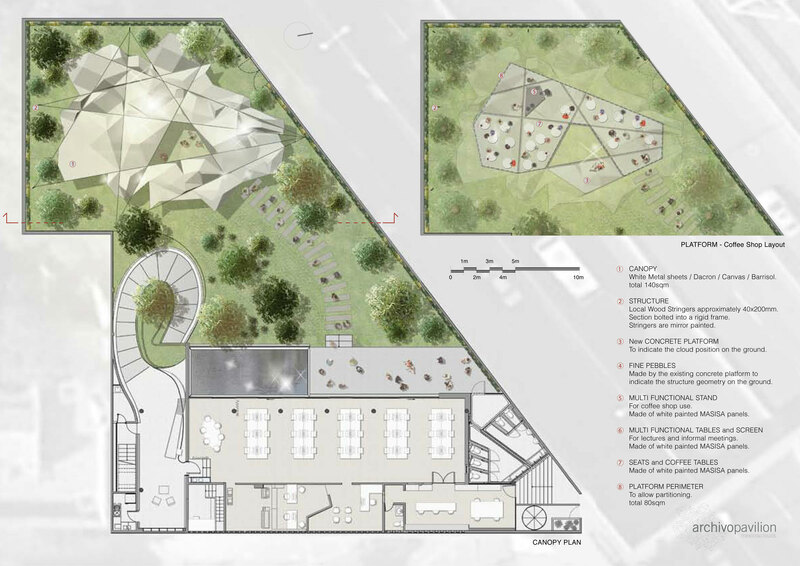 In an open plan layout platform, protected by an ethereal lightweight canopy and equipped with local and sponsor supplied materials furniture, Multidisciplinary activities will find their home. Coffee-shop, informal meetings, small concerts, lectures, contests, colloquiums, workshops – all these different events will be easily organised under the same Flexible structure just by rearranging the stage. The structure is ultimately conceived as a Dynamic and Experimental shelter that will Naturally fit into the Context both being Strong and temporary. A lightweight canopy creates shelter in the garden to allow different functions to take place. It s conceived as a natural element designed into architecture. Dynamic turned temporarily into Static. Even though the Pavilion is conceived for outdoor activities mainly, the perimeter of the platform allow vertical partitions to be easily installed if required. This is create approximately 80 sqm of dry and protected space. Lighting is incorporated in the Cloud so at night if will softly glow with warm light alltogether on the underside of the wood stringers, so at dark the structure would reveal its geometry. Welcome to the Archivo Pavilion. The Cloud is made of assembled metal sheets, white painted or enamelled, bolted together or Dacron/Canvas/Barrisol membranes mounted on simple internal metal frames and both options will be fixed to the wood stringers. Made of same section local wood stringers, approximately 40x200mm should be enough to keep the 12m span and will be assembled with simple bolt connection as a typical timber frame. All will be painted with mirror finish to reflect the surrounding garden and to loose the presence of it. A new concrete floor will be poored, or prefabricated slabs will be layed as per design. The old platform will be removed, made into fine pebbles to mark some lines between the new slabs.